After a serious car crash, Stefan comes round from a coma with a case of amnesia. Eva, his younger sister, is the only one who can see that Stefan is not really Stefan at all…When a strange letter arrives, written in gothic handwriting and addressed to Stefan, saying there has been a terrible mistake and signed by a mysterious ‘Hyacinthe’, the puzzle starts to unravel. Along with Eva, Stefan’s friends, Kim, Thomas, Harry, and Andrew must try to solve the mystery but to do that they will have to take part in a dangerous race, called The Game of Life. 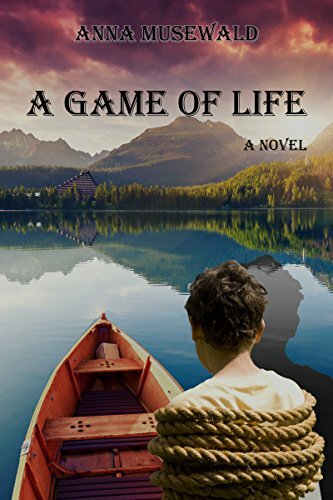 Anna Musewald’s A Game of Life is a YA fantasy and mystery novel which draws you in from the first page. The prose is so easy to read; it is witty and enchanting and feels perfect for a YA audience. In spite of the simplicity of the language, it doesn’t feel at all patronising or one-dimensional. The ‘game’ from the title is quite complex, with lots of imaginative systems and challenging tasks set for the players which really immerses the reader in the experience. I loved the inclusion of Greek myth, such as Apollo and the Sirens, woven through the narrative. The plot is in the vein of The Hunger Games and Harry Potter and the Goblet of Fire which could make it seem derivative, but with an original and inventive spin, it manages to feel fresh and exciting. Meaningful themes of friendship, loyalty and bravery flesh out the fun storyline. The pacing is excellent; I was instantly engrossed by the opening chapter and the book never let me go! We are drawn in by the question of what has happened to Stefan and led through a number of rabbit holes and strange happenings. The revelation isn’t made until the end which kept me greedily turning the pages, and there are also plenty of action scenes to keep the reader hooked until the final page. I had total belief in the characters, who all have distinctive personalities, and I loved the way that the friendships and rivalries are portrayed, showing the tangled and complex nature of relationships. The relationship between Stefan and Eva is particularly poignant and depicts the protective and intuitive nature of sibling relationships. The dialogue is funny and clever, and the conversation seems very authentic for a group of young people. One of the aspects that I enjoyed the most was the setting of Parsi and the fully formed ‘underground’ city created by the author which is full of fantastical and magical detail. Musewald excels at writing surroundings and conjures up place in a beguiling and descriptive way so that the reader feels as though they are on the journey with the characters. This is a great addition to the young fiction genre, full of twists and turns, mystery and suspense; I enjoyed the journey immensely. I gobbled it up in one go, and I can’t wait for another riveting story from Anna Musewald. Posted on April 3, 2018, in Book Reviews, Five Stars and tagged a game of life, action, action adventure, adventure, alibris, anna musewald, apollo, author, author life, authors, barnes and noble, book, book club, book geek, book lover, bookaholic, bookbaby, bookblogger, bookbub, bookhaul, bookhub, bookish, bookreads, books of instagram, booksbooksbooks, bookshelf, bookstagram, bookstagramer, bookwitty, bookworks, bookworm, bravery, brother, ebook, fantasy, fiction, friends, friendship, goodreads, greek, harry potter, hunger games, ilovebooks, indiebooks, journey, kindle, kobo, literature, love, loyalty, mystery, myth, mythology, nook, novel, publishing, puzzle, read, reader, reading, shelfari, sibling, siren, sister, smashwords, story, suspense, sword and sorcery, teen, teen fantasy, teen fiction, writer, writer community, writing, YA, young adult. Bookmark the permalink. 1 Comment.